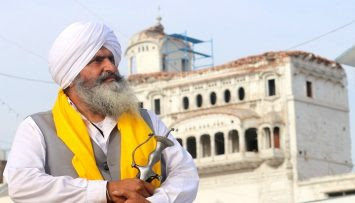 Posted: 13 Apr 2019 09:22 PM PDT CHANDIGARH, Punjab—Pentagenarian Sikh activist S. Karam Singh Bhoian, who was once a part of the armed Sikh struggle against the Indian state oppression, has been now struggling against the apex Sikh body SGPC and the Kaar Sewa sect headed by Baba Jagtar Singh for demolishing the historic Darshani Deodi of Gurdwara Sri Tarn Taran Sahib. He seeks indictment of every single person under criminal charges whosoever was indulged in committing this grave sin. Question: Why did you only think of sitting on strike when there were many other ways to streamline the Sikh outrage against the SGPC and the Kaar Sewa sect ? Answer: Like every Sikh, my heart also got twitched with the demolition of historic Darshani Deodi during the intervening night of March 30 and 31. Being a head of SAD (Amritsar) unit of this district, I felt it my responsibility to take up the cause so that the culprits could be brought to justice for committing this grave sin. On March 31, I shared my thoughts with the party president S. Simranjit Singh Mann to get his nod and on April 1, I sat on strike beneath this historic Darshani Deodi. Question: Your struggle has completed almost two weeks. What did you experience during these two weeks while sitting on strike here at the main entrance gate of this historic Sikh shrine? Answer: There is a sharp outrage among the Sikhs against the SGPC and the Kaar Sewa sect for demolishing this historic Darshani Deodi. Everyday, a lot of Sikhs from distant areas of Punjab and other states come here to extend support to my struggle. But during these two weeks, I have also faced abusing and threatening by the supporters of Baba Jagtar Singh. The local administration has been depicting a totally ignorant behavior on this issue. Even our complaint regarding threats given by the supporters of Baba Jagtar Singh is not being taken seriously. Question: Did you ever approach the administration or the SGPC seeking justice in this concern? Answer: My supporters have repeatedly submitted memorandums to the administration, but the administration is still not ready to indict the SGPC officials and Baba Jagtar Singh. I don’t think it’s wise to approach the SGPC when the SGPC officials are equally guilty of committing this grave sin. A few days back, my supporters had urged the Manager of Gurdwara Sri Tarn Taran Sahib to put a waterproof cover on the upper demolished part of this historic Darshani Deodi so that it could be saved from the drainage but till date there is no action. Question: SGPC is blaming Baba Jagtar Singh for demolishing this historic Darshani Deodi but he shows a copy of SGPC’s resolution to prove his innocence. According to you, who is the main culprit in this incident? Answer: The SGPC officials as well as the Kaar Sewa sect head Baba Jagtar Singh are befooling the Sikhs. Actually, the duo played friendly in this incident under a secret deal by keeping their safe sides. In reality, the SGPC general secretary Gurbachan Singh Karmuwala had assigned this project of demolishing this historic Darshani Deodi and constructing a new one in its place as a gift to the Kaar Sewa sect because this Kaar Sewa sect had endured a deficit in constructing a rest house near Gurdwara Sri Chohla Sahib. As we all know, the SGPC now says it had paused the resolution #550 of July-2018 to demolish the historic Darshani Deodi in October-2018 but Baba Jagtar Singh as well as the Manager of Gurdwara Sri Tarn Taran Sahib says they never received any written intimation in this concern. Even the duo parties very cleverly kept their safe sides, but still Baba Jagtar Singh’s oppressive attitude towards the Sikh sentiments has brought him under fire. Question: So in this situation, do you think you will achieve the target of your struggle? Answer: I know it’s not an easy task, but still I will continue my struggle till last breath. If today the Sikhs don’t act to get these culprits punished, the day is not far when they will demolish our sanctum sanctorum Sri Harmandir Sahib by declaring it unsafe.